When the angels had left them and gone into heaven, the shepherds said to one another, “Let us go now to Bethlehem and see this thing that has taken place, which the Lord has made known to us.” So they went with haste and found Mary and Joseph, and the child lying in the manger. When they saw this, they made known what had been told them about this child; and all who heard it were amazed at what the shepherds told them. Beyond the Manger was inspired by the writing of Joseph Martin and Ray Bakke. 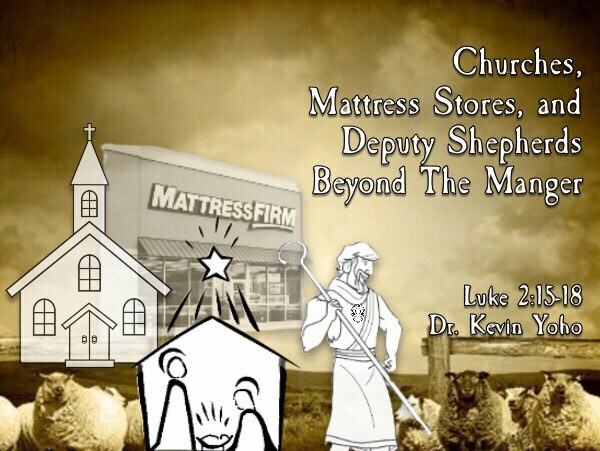 Find out what churches, mattress stores, and shepherds can teach us beyond the manger! The sounds of the hammer fall, I see a rugged cross, the chill of night. No host of angels sing, There is no candle glow. Like the shepherds, you have met at the manger tonight. And can now see beyond it! To the life, words, signs, and work of Jesus. To the cross. The empty tomb. The ascension and promised return! And you are being sent out as deputy shepherds! That’s right. Each of you has a job to tell the community: There is hope. Spiritual resources are available for young and old. Our mission is to those who have not been reached. To proclaim the Good News about Jesus, and if necessary, use words! What have you heard? Will you make it known? What gift have you received? Will you share it? What hope and peace have you felt? Will you go and tell the amazing news!? Then our entire community can see God’s amazing love and get the spiritual resources it needs for wellness and living the abundant life Jesus promises! Now, get up, deputy shepherds, and go! What an exciting time of year! Christmas! One of the joys of Christmas is the Christmas Card. Has your family received Christmas Cards? I especially like the ones with a photo on them, a photo of the family. I have some to share with you. Here’s a favorite of mine: It’s of my dog, Finn. Yes, that’s right, he sent his one Christmas card this year! Even better, here is a dear friend’s family pictured on their card. And another. Here’s a family photo, very nice! We love photo Christmas cards because they tell a story. They show us what the family is like. 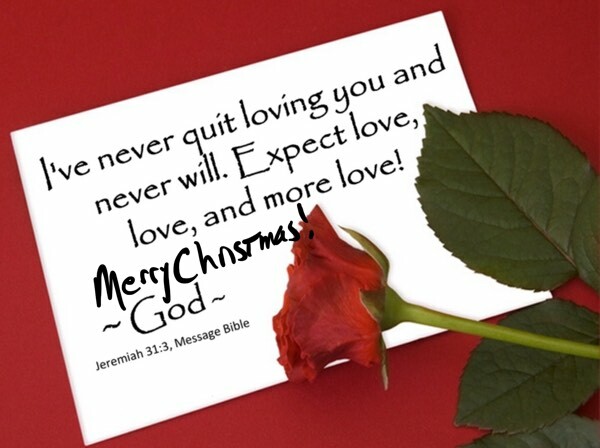 Did you know that God sent a Christmas card to you? Oh, yes, God sent an amazing Christmas card and its of the scene right here: the manger. A long time ago Jesus was bored. Jesus is God’s son and you can see that Jesus was bird in a house with the animals all around. What animals do you see? And others were there, too. Here is a shepherd. The shepherds were out watching their sheep at night when thousands of angles appeared. Here’s our angel. Imagine all these angels telling the shepherds to hurry up and go see the baby, who is God’s Christmas card to us. God’s love letter, the Bible, tells us all about Jesus. And Jesus grew up and showed us how we are to live our lives by doing things for others just like you have been. Cleaning chores, making meals with your family, baking cookies for your neighbors, showing love to others, helping kids at school, all these are practical ways to give because God gave us a most incredible gift of his son Jesus who gives us life that will never end! Jesus said, if you see me, you have seen God. That’s one amazing Christmas card, isn’t it? Let’s pray and thank God for Jesus, and for showing us the way this Christmas. 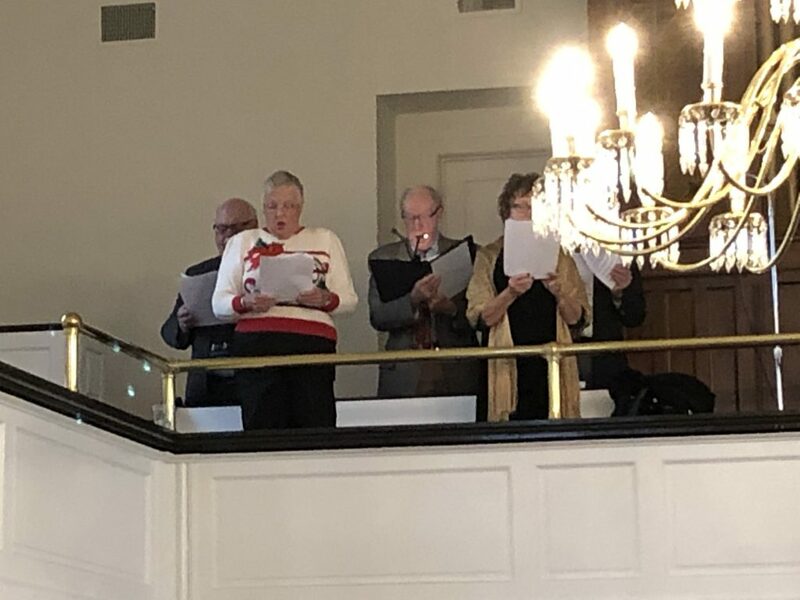 Music, O Holy Night, a solo by Barbara Caine. Jayne McDonough, accompanist. “Gesu Bambino”, a solo by Lenore Bowne, accompanist is Jayne McDonough. 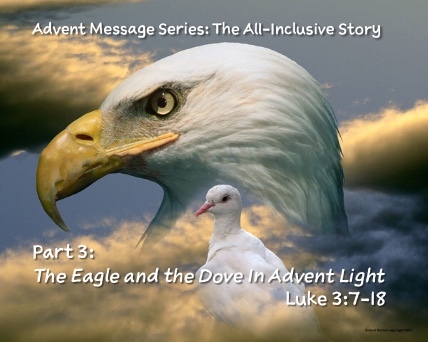 This year’s Advent Message Series is titled The All-Inclusive Story featuring the animals of Christmas. Animals, you ask? Yes! You can become a part of the story, too! The eagle’s sharp eyesight and the dove’s spirit will inspire us this week as we over-hear John the Baptist challenge the community who met him at the Jordan River. It was as if he posted on his Facebook page and live-streamed his message for all to see. What did John say about Jesus? What were the “take-aways” for parents, shopkeepers, and military types? What are we required to DO for Christmas? This week, our lesson from Luke 3:7-18 will challenge our preconceptions about Christmas and exchange them for eagle-eyes and a dove’s spirit which will provide a foundation for experiencing the presence of God in our lives today. Everyone is welcome to come and worship with us every Sunday in December. Enjoy special music, an interactive and inspiring message from God’s word, and a joyful community of faith! Listen and consider how you can put “doing” into Christmas! Christmas includes the tradition of exchanging gifts with those we care about. And also it includes volunteering and serving others in new ways. We call these activities acts of kindness. Christmas is about doing. Last week you selected an activity, what did you do. Read a book with a friend. That’s awesome! Well this week, I will offer you three challenges! Are you up to it? I have some great “gifts”, acts of kindness suggestions in this Advent Tin for you to choose from! Reach in a see what your challenge is this week. Great. Invite a friend to Christmas Eve service. Pick another. That’s a really good one: Help in the kitchen. Another. Make a Christmas card for a neighbor. God wants us to show our gratitude for his “indescribable gift” of Jesus! Thank you for being with me today! Be blessed as you do Christmas this week! Let’s pray. Did you know that earliest followers of Jesus didn’t celebrate what we call Christmas? That’s right. In fact, it took them 300 years to set the date! Why? The focus of the early believers was on the life and work of Jesus as the promised Messiah, the Christ, and the birth narratives were not thought to be central to the Jesus-stories. The focus was on the atoning work of the cross, death, burial, resurrection, ascension and Jesus’ promised return. A few centuries later, however, it became important to introduce a more complete story of the Savior to show his full humanity and full divinity. The scholar and pastor, Jerome (347-420 AD), helped early believers learn the four gospels using familiar creatures, each representing a diffferent animal. Mark (the Lion), John (the Eagle), Matthew (humans) and Luke (the Ox). This year’s Advent Message Series is titled The All-Inclusive Story featuring the animals of Christmas. Animals, you ask? Yes! 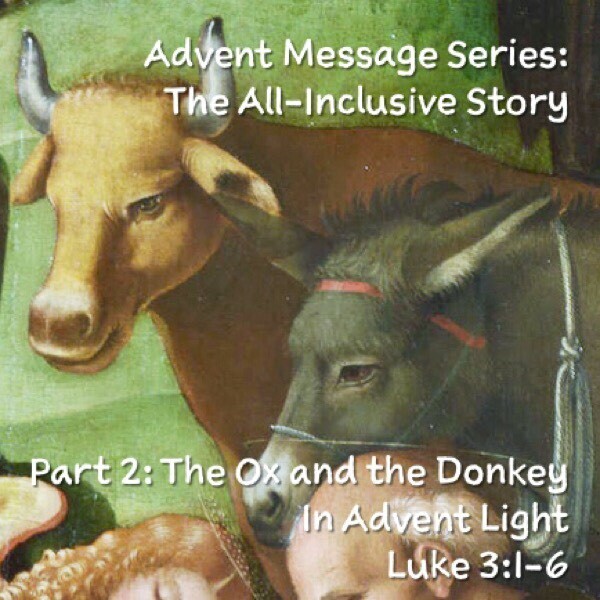 On the second Sunday of Advent, this week we will consider the ox and the donkey as images to help tell the Christmas story. The Gospel of Luke features the important role John the Baptist as a messenger to level the playing fields of life. The Good News is for everyone! God is in the business of smoothing out the rough edges, the ups and downs, the obstacles that impede our learning and growth as followers of Jesus. Listen to the an all-inclusive adventure toward Christmas hope this message.